Wow. I just woke up and thought I dreamt of putting up a post about some Civil War history. What a bad idea. What a stupid, moronic boat anchor of an idea. Can you find a more effective way to lull your reader ( that would be you) into a deep and reparitive slumber? History, of all things. Next you’ll be throwing some astronomy-related crap that’s dripping with mathematical references up there. Now that would just about kill off your reader ( that would be you) once and for all. But first, I would have to get a feeble grip on the math. Hasn’t happened yet. Not to worry. Yes, he’ll always be remembered for a string of horrible mistakes ( the bridge at Antietam, Fredericksburg, the Mud March, the Crater). But I think that he really believed in the Union cause and fought to win or end the war, rather than just try to advance his own career in the usual Napoleonesque fashion that was quite commonplace at the time. He thought out of the box, which was almost nonexistent then. The only others who did were Lee and Jackson, and they’re immortal now. Doesn’t seem quite fair in retrospect. I have actually located his gravesite at Swan Point, and in a sea of gigantic monuments, his can barely be found. And that’s after serving two terms as Governor. Jeez, William Sprague‘s cat has a better grave marker. Ambrose deserves better. Anyway…let’s finish the Fredericksburg thing and move on. Ok then; the image I wanted to leave you with was of the open expanse in front of the Sunken Road being strewn with absolutely horrific carnage. How about a modern-day ghost story with the central characters sharing their neighborhood with intermittent battle scenes? I like it…it’s starting to tingle. Oh, and if you’re ever in Fredericksburg, please stop at the little restaurant on the riverbank and get some crab cakes. Absolutely fabulous. As to the tingling, I’ll keep you posted. Pun intended. Here’s another good writing idea, and I don’t know if I’m good enough to attempt this one either. But I’m a real cracker when it comes to thinking of stuff. 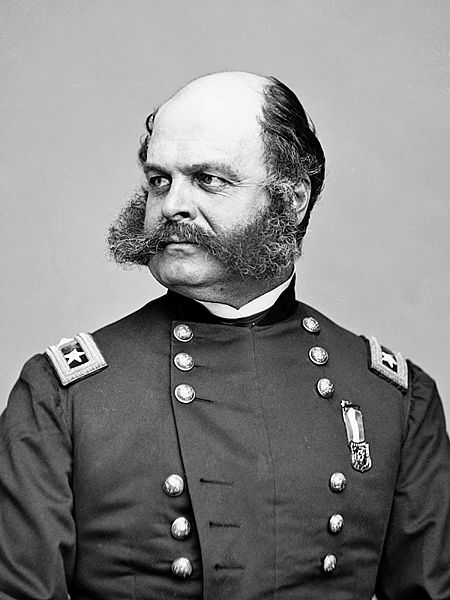 But luckily, General Burnside was just a little bit preoccupied. He had just screwed up badly a few months previously at Antietam, and had somehow managed to end up with a promotion out of it. In his defense, he told Lincoln that he was not capable of overall command, and refused; but presidents usually get their own way. 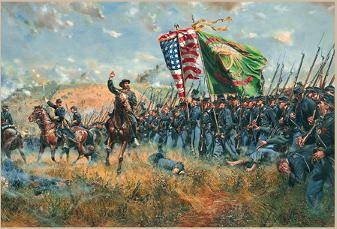 And at the moment, he was getting outdone pretty badly by Gen. Lee. Fredericksburg was now heavily fortified, the pontoon boats were three weeks late, it was cold and snowy/ rainy, and he had all his forces sitting in the mud without supplies watching all this develop. Lincoln was after him to move, and he was totally stuck. He couldn’t back up, and he couldn’t get across the river to get into Fredericksburg. So he really didn’t have much time for small-scale stuff. Damn good news for the bounty jumpers. By Dec. 13th, the pontoons had arrived; they managed to get across the Rappahannock in spite of the 21st Mississippi, and Ambrose went about adding to his resume by bombarding and pillaging the town. They finally got across and started forming for battle. Fredericksburg is tucked right against the banks of the Rappahannock, and on the other side of town was an open expanse of about a half-mile to Marye’s Heights. This is where the Confederate artillery was thoroughly entrenched and waiting. Ambrose knew this, he had been looking at those guns for weeks, and decided that a full frontal assault was the way to go. Very, very Napoleon. And just like Napoleon, was guaranteed to get a great many people killed. The Yankees formed their brigades in the streets of the town; one at a time, and through the course of the day sent a total of twelve brigades out towards the Heights. Final score; 12,647 to 5000. Not a single blue coat made it to within fifty yards of the wall. In order to finish this, I need to put up another still and a video clip, and will do so promptly tomorrow morning; so stay posted. Pun intended. Strange. I get more hits on this thing when I don’t put up anything new. What does that mean? People would rather listen to Schenker noodle around than read my posts, that’s what. Well here’s more Michael, then. Both Michael and L .West showed up at the same time. Now that proves that there is a God. JS Bach says he likes the guy with the V. Doesn’t care much for West ( too pentatonic bluesy ), but sees Schenker as a total Bach convert. Says it’s not neo-classic to him, because he invented the stuff. The collective English queens would like to know how Michael came by his British accent. They like it. They say that Michael can come hang out at the Opera House any old time. On the writing front, I’ve got an idea that I just wish I was good enough to not mess up. I would like to be able to write a semi-fictitious account of my great-great-grandfather’s military career. Here are some of the facts on which I could frame the fiction. 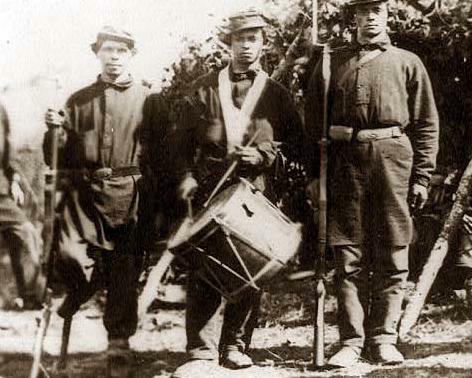 James Coyne enlisted with the 2nd RI Volunteer Infantry in East Providence in August of 1862. On the morning of December 5th, the 2nd was encamped at White Oak Swamp in Stafford, VA; and the regiment received their first pay ( probably including the app. $100 sign-on bonus for new recruits- an obscene amount of money by 1860’s standards ). The regiment then set out down what is now Rt. 218 in Stafford towards Fredericksburg. James ( and two other gentlemen from Warwick) never arrived. Officially, James does not appear again in the world until he gets married, back in East Providence in 1864. So there is a two-year gap that I can’t account for; and that would serve as the time setting for the fiction. I would dearly like to fill in that gap. Off the record, I suspect that he might have been a bounty jumper; because his name shows up later on the rosters of both New York and New Jersey. These guys would collect a sign-on bounty, and then desert; and do it again, if possible. The record stands at 32. It was punishable by death, imprisonment, and public humiliation. Makes me feel just so warm and fuzzy inside; not exactly the spit-shined glorious Civil War history that we Americans are so fond of. But then again…if he had made it to Fredericksburg, I might not be here to tell you this heart-warming story. And if that had happened, who would feed you guys Michael Schenker clips?